LIFETIME WARRANTY ON THIS ONE OWNER 2016 DODGE RAM 1500 CREW CAB 4X4!! READ CLOSELY: THIS ONE OWNER 2016 DODGE RAM 1500 CREW CAB 4X4 COMES WITH A LIFETIME ENGINE TRANSMISSION AND FULL POWERTRAIN WARRANTY AT ZERO COST TO YOU!! THAT INCLUDESD THE 4 WHEEL DRIVE!! Look closely at this 2016 Dodge Ram 1500 Crew Cab SLT 4X4 that just arrived here at Hometown. It's just been fully serviced too from front to back, so this Ram is 100% ready to go to work. All power on the inside with navigation, heated seats, step rails, remote start, keyless remote, tilt, cruise, all weather mats and much much more. This Ram drives and handles great out on the road and the 4-wheel drive works flawlessly every time. It's as nice as any new truck you'll sit down in. Make the drive to Hometown and see for yourself. You'll be impressed. We offer on the spot financing, so you can take this Ram home today. 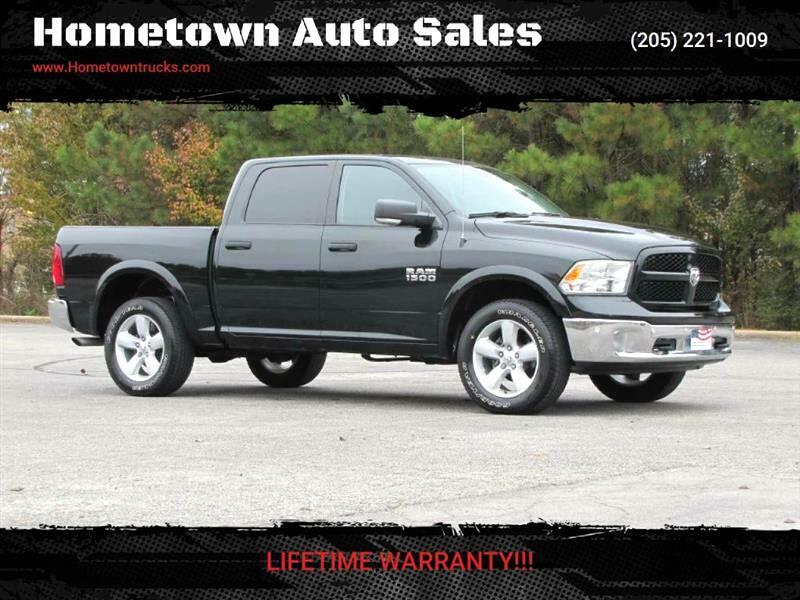 Also, keep this in mind if you compare other trucks out there to this Ram: THIS 2016 DODGE RAM 1500 CREW CAB 4X4 COMES WITH A LIFETIME ENGINE TRANSMISSION AND 4 WHEEL DRIVE WARRANTY AT ZERO COST TO YOU!! NOT A 30 60- OR 90-DAY WARRANTY...... A LIFETIME!! Call JJ at 205 471 2112 or Roger at 205 522 8345. You can reach the office at 205 221 1009. Thanks! !